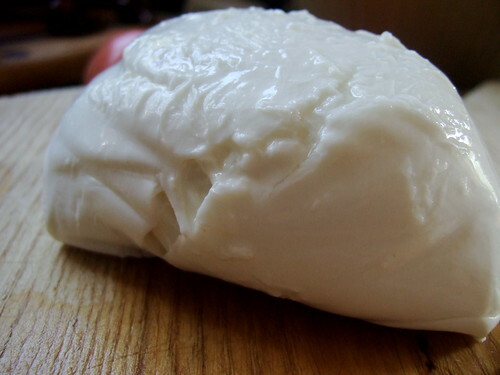 Photo: Mozzarella di bufala. A bit old because it flew from Italy, but still delicious. Here plops the cheese. I was deciding on what we should eat for breakfast while doing our Saturday morning routine (Del Ray farmers’ market, Steve the Butcher, Cheesetique, Planet Wine, Gold Crust Baking Company). I stood in front of the refrigerator in Cheesetique contemplating the burrata and the mozzarella and the fior di latte. The farmers’ market had piles and piles of ripe, red tomatoes, but I knew I could pick some partially ripened ones in my backyard. Photo: Two kinds of homegrown tomatoes, an Old Virginia between two Rose de Bernes (from Switzerland). Picked not fully ripe, on purpose, see below. 1) This is a summer dish to be enjoyed only in response to heightened UV rays, heat, and pulsing alive tomatoes (see rule 3). If you serve this to me in the winter, I will eat it politely with a sad heart. 2) The cheese can be either buffalo milk mozzarella or cow’s milk fior di latte–yes it matters what you call it, but either is fine for the salad, with a caveat. 3) If using mozzarella di bufala, the tomatoes should be not fully ripe, a small amount of green in the tomato provides some texture and acidity against the creamy sweetness of the cheese. Taste the fior di latte you have because it is much more variable than cheese made from deeply fatty buffalo milk; if it is not very creamy and sweet, a very ripe tomato will bring a sweetness to the cheese. Nevertheless, I prefer the texture of slightly green tomatoes against the soft cheese. We lived in Naples for several years and I was never served an insalata caprese with very red tomatoes. 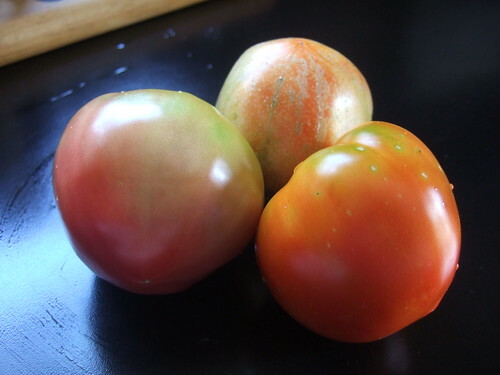 Why is it that every recipe I read in various cookbooks and magazines calls for fully ripe tomatoes? I really think the texture and acidity balance requires 3/4 ripe tomatoes: good tomatoes, ones that had happy lives with roots in the dirt, ones that resisted bug attacks on their own, and perhaps (but I’m flexible on this) ones that came from seeds that remember their grandparents, seeds that have stories of the old ways in them. 4) The rest of the ingredients are fresh basil (but not much, negligently toss a few leaves in), a drizzle of good olive oil, salt, and pepper. 5) Layering slices of tomato and cheese and drizzling the oil to make a fancy presentation is fine, but a mess in a bowl sopped up with bread is optimally delicious. 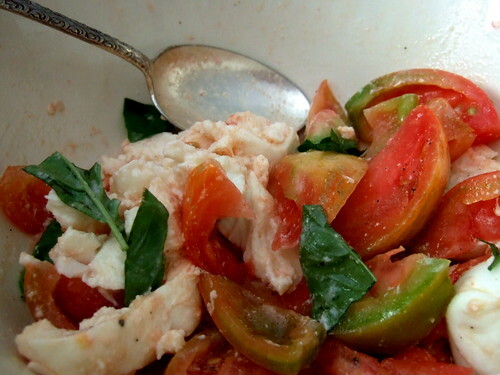 Photo: Messy, delicious, sop-with-bread insalata caprese. Oh I totally agree! We so much miss tomatoes here… we just have plum and cherry tomatoes.. the big boys and heirlooms just can’t grow here. Que lastima. Tried to kayak on the presa today but the water is way too low and areas are landlocked. Called and left a message? I hope you will still have tomastoes in your garden in mid-October when I get there. Re the insalata, I have always found mozzarrella to be a little too bland. Maybe, as you indicate, I just wasn’t using the right kind or ripeness of tomatoes! Your “messy” photo reminds me a little of Italian bread salad, which I love, along with you guys. FF.